Hello, you cultured and historically interested visitor to Amsterdam. You’ve stumbled upon the expertly guided tours of art historian, Dr. Michel Didier. Michel was terrific – upbeat, knowledgeable, good sense of humor and kept a great pace that exerted us a bit and offered frequent stops. I’ve been to Amsterdam 4 times before but never seen it like this or experienced so many hidden places only a local would know about. First, there’s the massive Rijksmuseum, home to Rembrandt, Vermeer, and the Golden Age of Dutch painting. Then there are the canals, four times as many as in Venice, with twelve times as many bridges (1500 of them). If you are interested in miracles, there’s Medieval Amsterdam – very surprising and decidedly offbeat. Did you know Amsterdam was a Holy City, because of a true miracle performed in 1345, acknowledged by the Pope as one of only eight (8!) miracles acknowleged in all of Europe in the Middle Ages? 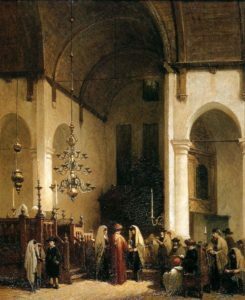 As a result, Amsterdam became a very popular pilgrim’s destination, and no less than 21 monasteries sprang up in the city, which were converted into municipal institutions after the Calvinist takeover. The tour takes you through alleyways and along medieval canals, past former convents and to the miraculously preserved Holy Host of the original Miracle! Discover the narrowest alley of Amsterdam and a complete, hidden Catholic church during an exploration of the Red Light District, which centers around the Old Church, the oldest construction in town. More miracles are to be discovered in a tour of Jewish Amsterdam, known by the Jews of old as ‘the Jerusalem of the North’. Jewish immigration started in 1600, and quickly a large Sephardic community was formed, and the city became the main home of Jewish learning world wide. Although Jews mixed with Christians and others, most preferred to settle in the new quarter in the east of town, which came to be known as the Jewish Quarter. The Sephardim were eventually outnumbered by Ashkenazim from Eastern Europe, who settled in the same area, but built their own synagogues, and, as required by the municipality, their own orphanages, old age homes, and other institutions. Jewish life was destroyed by the nazis in WW2, and re-emerged on a much smaller scale after the war. The synagogues and a number of institutional buildings are still standing and have been restored. 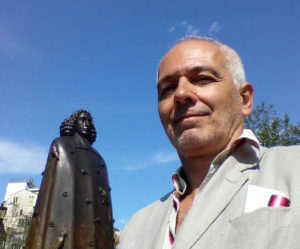 The tour includes a number of synagogues and Jewish institutions, monuments to the deported and murdered, but also to the big names, like Baruch Spinoza, the best known Dutch philosopher of all time. We had a great time with Michel! He was very knowledgeable about the history of the Jews in Amsterdam. His presentation was well done & we loved the use of his iPad for additional visuals. We all learned new information & felt our time was well spent. Thanks for a great morning! Tour was excellent. Michel very knowledgeable and gave us a thorough overview of the neighborhood and its history. Extremely worthwhile experience. Michel was awesome! Very knowledgeable—and interesting and very well prepared. I learned a lot!!!!! Great tour! Our guide weathered difficult weather with us, was generous with his time and his knowledge. We learned so much. Thank you! Kenneth and I have not stopped telling everyone what a wonderful, in depth tour you provided us during our stay in Amsterdam. I would highly recommend having you guide other visitors through “Jewish Amsterdam” as well as other selected themes to anyone visiting this beautiful, exciting city. Enjoy a taste of Amsterdam on the Culinary Tour, full of Amsterdam specialties: the best herring in town, spirits in the oldest genever bar in town (1650! ), locally brewed beer, raw beef sausages, cheese, and croquettes with either beef, veal, or shrimps. And the local confectionery. Lots of history and sightseeing on the way. Michel, Tom and I really enjoyed our tour with you yesterday. Thank you for some wonderful insights to your city, and for introducing us to jenever and raw beef sausage, and salty licorice. 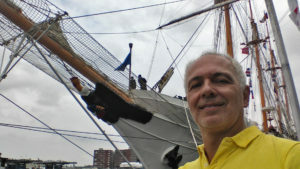 Discover the history of the port in the Maritime Tour, from the VOC (United East India Company shipyards (where czar Peter the Great worked as an apprentice), the Admiralty Arsenal and VOC ship replica, to the present busy port which hosted 44 tall ships during the 2015 edition of Sail Amsterdam. To rid ourselves of the smelly fish oil and tar, the tour ends in the city’s best local brewery, located next door to one of the few surviving windmills within the city. 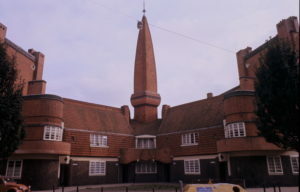 Discover why Amsterdam was once called ‘the Mecca of social housing’ with its spectacularly designed, Expressionist brick buildings of the 1910s and 1920s. The Hague is where the royal family resides. It is also the seat of the Dutch government with its Upper and Lower Houses (Het Binnenhof). The many foreign embassies cluster around the seat of government. A walking tour of the city center also covers the greatest concentration of Art Nouveau in the country. The Mauritshuis houses the former Royal Art Collection, with quite a few famous paintings by Rembrandt (The Anatomy Lesson) and three by Vermeer (amongst which, yes, the Girl with the Pearl Earring). The Hague is the United Nations judicial center. In 2013 the Palace of Peace celebrated its first centennial. Nearby are the Yugoslavia Tribunal, and Interpol HQ. 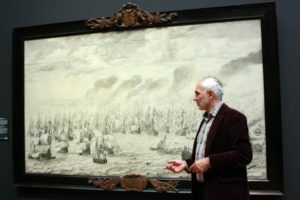 The Gemeentemuseum (Municipal Gallery) houses one of the country’s best art collections, and there are always at least three temporary exhibitions going on. Madurodam– Holland in miniature – is a delightful venue in The Hague for both adults and children. Because it is so difficult to get there we decided to hire a private guide and did not regret our decision to do so one iota. Michel Didier was a brilliant guide. His knowledge of Van Gogh and the other artists represented at the museum was remarkable. 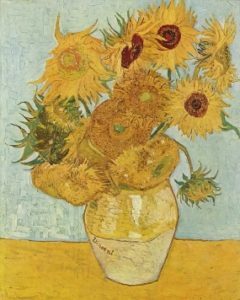 It was so satisfying being made aware of Van Gogh’s private life as well – it all came alive. I actually cannot recommend Michel highly enough. We had a great day. The charming town of Haarlem is only ten miles away from Amsterdam. Here you will find the Frans Hals Museum, housing the largest collection of paintings by the town’s foremost Golden Age painter, Frans Hals, famous for his loosely painted, expressive portraits. Delft is, of course, home to Delftware or Delft Blue, but also to Johannes Vermeer of Delft, and to the Royal House of Orange, that is, they all lie buried there. 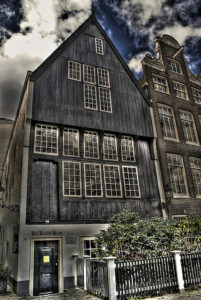 One 17th-century pottery operates to this day and includes a magnificent museum of Delft Blue pottery. 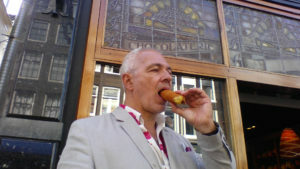 Delft is next to The Hague, so it would make a combination for a day’s outing. 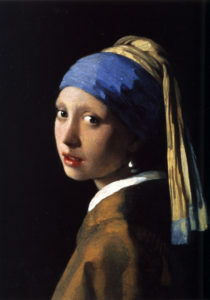 For instance, a Vermeer tour would include his paintings at the The Hague Mauritshuis museum and a number of locations in Delft, including his birth house and burial church, the spots from where he painted his famous town views, and Vermeer Center, located in the guild house where he was overlord of the St Luke’s guild, where reproductions of all of his paintings can be seen. For each of these tours, made to custom, personal transport can be provided for a modest extra cost.